Just over a year after coming home, one of the rescue ladies from the battery farm died, so this has necessitated more birds for the hen house. I went back to Hens4Pets to get two hybrid birds, a Magpie (black) and an Amber (white). When they asked what I was looking for, I just said “not brown.” It’s good to have birds you can easily disambiguate. They’ve been with me a couple of weeks now, settling in. The pecking order is very clear and the old ex battery Attila the Hen is not letting the new birds eat from the feeders, just the corn on the ground. This is when I’m standing there, anyway. Given that all of the food is going, the new birds must be able to manage to eat some of it when Attila is not looking. The new ladies in the coop reminded me of some common chicken behaviour that the battery birds have never learnt to do. They dig through the ground. They fly up to the perches. They dust-bathe. Attila just doesn’t do those things. I’d forgotten that was odd. On the whole the ex-battery hens have not been great. They haven’t laid well. The eggs they have provided have had extremely thin shells. Towards the end I’d resorted to paying for eggs and chicken feed, and that’s not how it’s supposed to work. Attila is not laying, but the new black chicken is very consistent and provides a tiny egg every day. 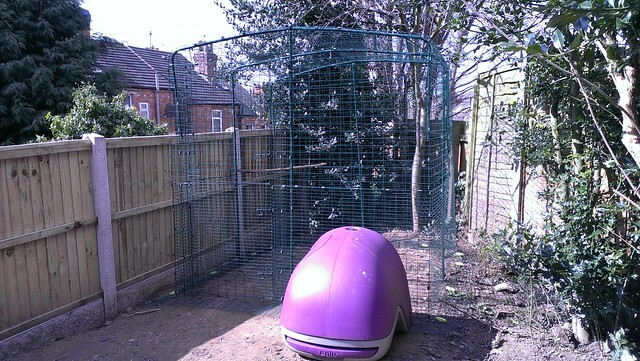 Look how overgrown the coop is now compared to when it was built five years ago! 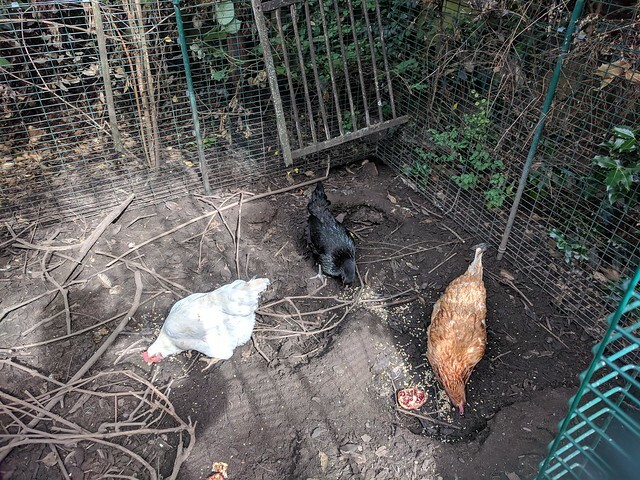 This entry was posted in Animals, Garden, Uncategorized and tagged chickens.